Anyone else out there as pumped for Thanksgiving this week as I am? For whatever reason, last week hit and I was unable to focus at work because I was SO excited that my favorite holiday was just a week and a half away. Food, family, a few days of paid vacation from work? All of my favorite things! The older I get, the more appreciation I have for family traditions. A quick 5k to get the holiday started, Thanksgiving dinner at my parent's house, and more than likely a happy food coma at the end of the night. Bliss. This will be Andy and I's third married Thanksgiving and each year we seem to add in and refine our own traditions. Building our own family traditions wasn't something I really put thought into before we got married, but I love deciding what we want holidays to look like together. The most important family tradition: the food. 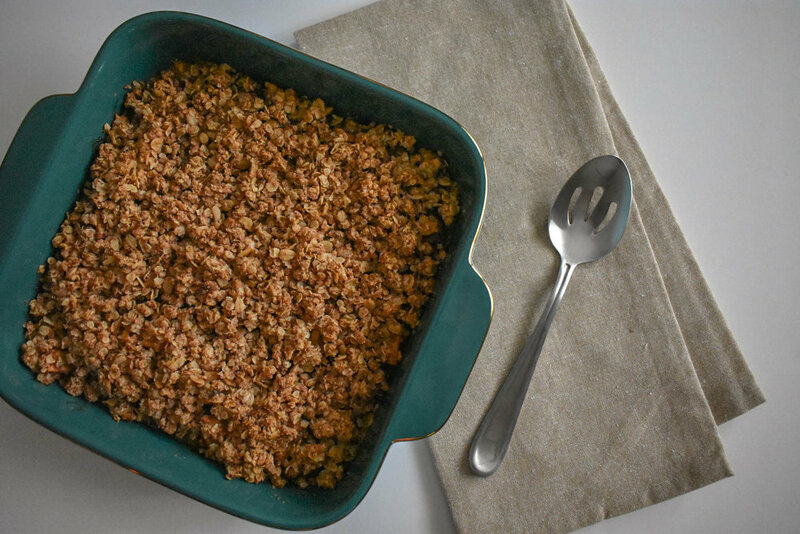 Our family is never without apple crumble at Thanksgiving. While this isn't the exact recipe my dad and I usually bake, it's easier to make, healthier, and simple to dish up. There is enough going on Thanksgiving day without spending hours in the kitchen wrestling with your pie crust and butter crumble. 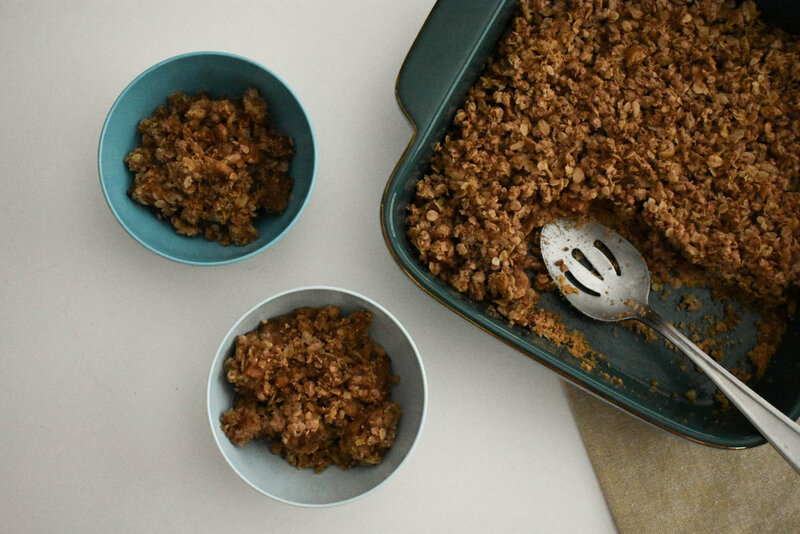 This crumble is crisp, cinnamony, and perfectly sweet. Did I mention it's also vegan and gluten free? It's the best way to round out your Thanksgiving meal, and would be the perfect second dessert on Thanksgiving night (Yes, second dessert on Thanksgiving IS a thing in our house and I highly recommend it). In a bowl, combine all of the ingredients for the crust. Firmly press the mixture into the bottom of the dish and bake for 15 minutes. 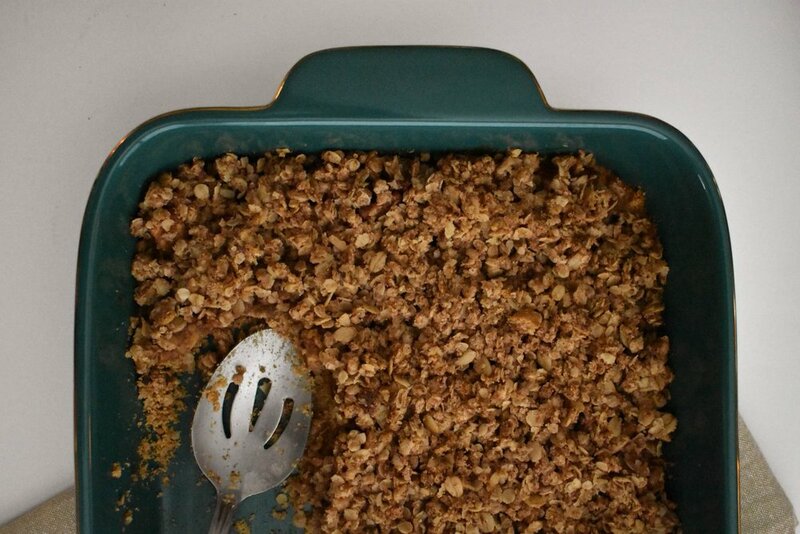 While that bakes, combine all of the ingredients for the filling in the same bowl. Set aside. 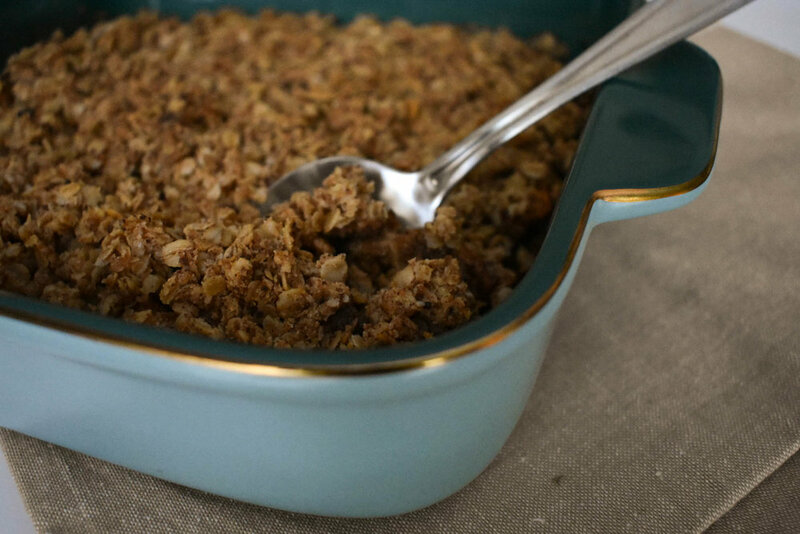 In a separate bowl, combine the crumble ingredients, slowly adding in coconut oil and working the mixture with your hands until a crumble is formed. When your crust is done, evenly spread with the apple mixture, followed by the crumble mixture. Bake for 40 - 50 minutes or until the top is golden brown.